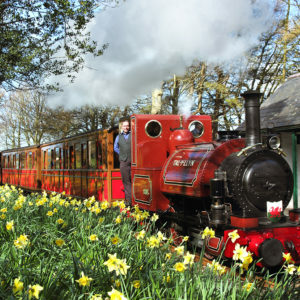 Truly a 'Great Little Railway', Ffestiniog is the oldest independent railway company in the World today. Established by an Act of Parliament in 1832, built to serve the slate industry of Blaenau Ffestiniog. You can experience 'history on the move'. 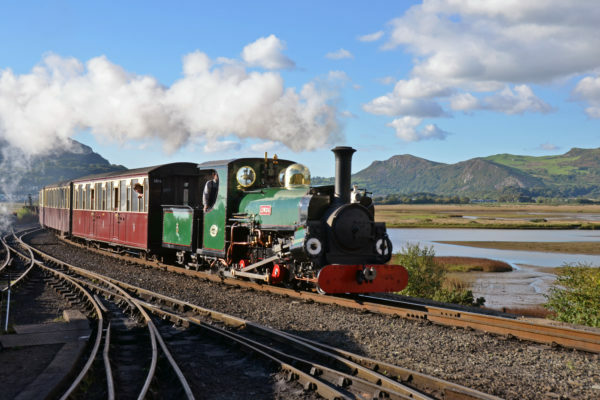 In May 2007, Ffestiniog proudly celebrated the 175th anniversary of the founding of the line, and in 2014, the 60th anniversary of the post-war opening of the first stage of the revived railway. 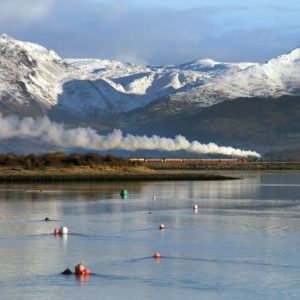 With the rebuilding of the pre-war Welsh Highland Railway now complete, and a new £1.25 million two-platform layout at Harbour Station at Porthmadog (complete with a substantial semaphore signalling installation), it is now possible to connect with Caernarfon-bound trains and experience 40 unbroken miles of spectacular narrow-gauge steam. Originally built to serve the slate industry of Blaenau Ffestiniog, the line used to be operated by gravity. Wagons laden with slate rumbled down the hillside, kept under control by intrepid brakesmen who leapt from wagon to wagon tightening or loosening the brakes while their colleague on the front wagon blew his horn to warn others of its passage. 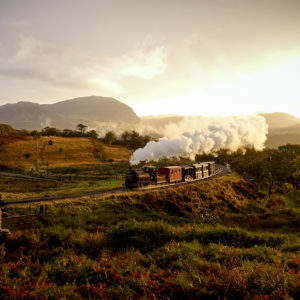 Steam locomotives were introduced in the 1860s and today some of those same little engines haul carriages of holidaymakers through the stunning scenery of the Snowdonia National Park. Blaenau Ffestiniog, at the head of the valley, still bears the scars of its industrial past with slate tips all around. One of these quarries is open to the public and makes an interesting addition to your day out. 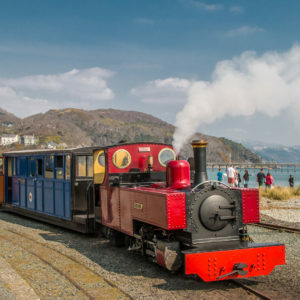 The station is situated in the centre of the town on the A470 and is shared with the Conwy Valley Line which runs from the North Wales coastal resort of Llandudno, connecting with the main line at Llandudno Junction. Tan-y-Bwlch Station, half way along the line, is situated just off the main valley in the Merionydd Oakwoods. There are many nature trails starting at the station, a good place to break your journey and explore. The licensed café, open Easter to October, serves a tempting selection of hot and cold snacks. The café is licensed for weddings and makes an unusual setting for your special day. Porthmadog's Harbour Station, the headquarters of the railway, is where most trains start and finish. The station is situated on the A487 at the eastern end of the town. The main gift shop here offers a wide selection of gifts and souvenirs and also supplies the online shop www.festshop.co.uk. A visit to Spooner's Café and Bar in the old station goods shed is a must, with a wide selection of food and beverages on offer. Spooner's is justly proud to have won a CAMRA award for 'Local Pub of the Year' three times in the last four years. They have special events throughout the year and also host a 'Guest Driver' programme. 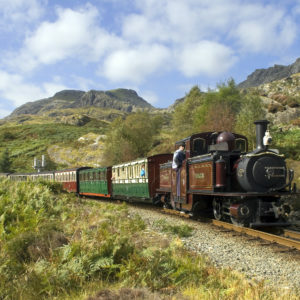 A visit to the Ffestiniog Railway is 'history on the move' and a whole lot more too! Porthmadog: The Cambrian Line runs from Shrewsbury in Shropshire, England, to Porthmadog. 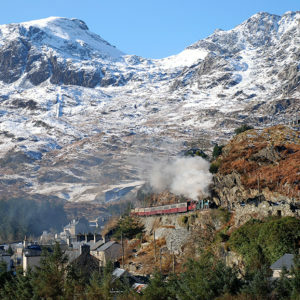 Blaenau Ffestiniog: the Conwy Valley Line runs from Llandudno Junction to Blaenau Ffestiniog. Porthmadog: is served by Traws Cymru T2, a direct service between the University towns of Bangor and Aberystwyth seven days per week, stopping at Caernarfon and Porthmadog. Arriva buses and Lloyd's Coaches also provide a bus service. Blaenau Ffestiniog: Arriva buses, John’s Coaches, Llew Jones Coaches and Lloyd's Coaches also provide a bus service. Porthmadog: Parking is available in Porthmadog Harbour Station (LL49 9NF) £2.00 all day car park. If it is full, you will be directed to the overflow Car Park £2.00 all day. Blaenau Ffestiniog: No parking facilities at the station, but nearby public parking is available.